The Passion Of The Criss: HAPPY NEW YEAR!!! Soon another year is coming to a close, and a new one is preparing to start....2012 was a pretty difficult year for us, many downs, more than I care to re-live. There were also pockets of great happiness, and I grew so much, and learnt more about myself and others. 2012 taught me that not everyone is good, but some are wonderful. The trick is to figure who is who. Trust your GUT. If things are too hard, don't make sense, or a real effort to do, or what is being asked of you is causing you pain, and much heartache, then it is probably VERY WRONG for you, so LISTEN to your GUT. 2012 also taught me that when things get hard, fight harder. Fight for what you love. It is worth it. It is always darkest before the dawn. Let's Welcome this year with SMILES on our faces and HOPE in our hearts for the BEST. Let's hope 2013 is TRULY the NEW AGE we have all been waiting for, and that it is BEAUTIFUL for ALL. 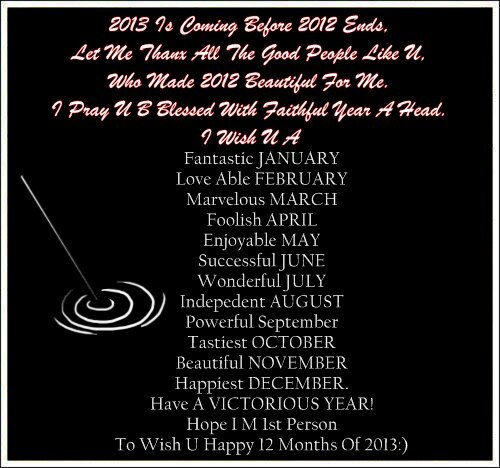 I wish YOU are very HAPPY 2013.